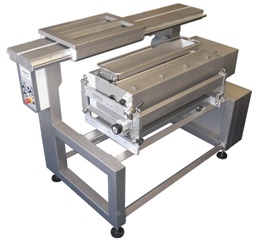 RST machines are available in 4 Standard widths: 800mm, 1000mm, 1200mm and 1500mm. 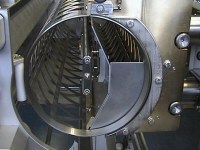 Optional automatic feeding device for RST with controlled feeding of the aerated mass, paste, etc. The spreading movement by a horizontal stroke can be controlled and set automatically by the RST controller. The unit can be ordered as a mobile unit with docking ports on the sub-frame oras a standard unit mounted at the sub-frame. With the Rotary Template Depositor we can achieve a production speed of up to 32 meters/minute. However, it is very advisable to take the length of the oven (conveyor) into consideration when determining baking time. 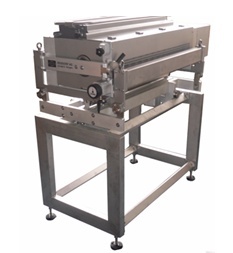 The synchronization of the RST with the conveyor speed can be set by an incremental transmitter with speed measurement mounted at the steel tail pulley. 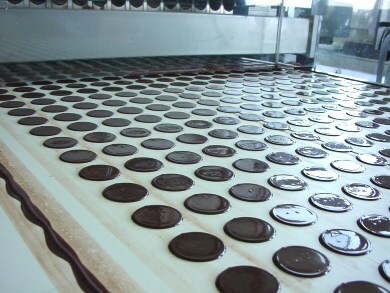 To improve the shape and quality of the cookie shape the synchronization speed can be set manually by a code switch in the range of approx. 5% slower or faster than the conveyor speed. 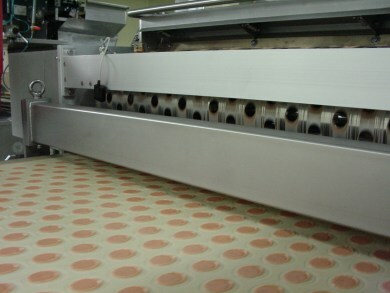 The machine can also be used for the stencilling of chocolate or for the deposit of tomato paste directly onto a biscuit.